I would have never though that tea, which I dislike drinking, could prevent cancer. A couple days ago as I researched online for my project, I happened to find a very interesting blog entry about the chemo protective benefits of green tea. The Mayo Clinic in the Journal of Clinical Oncology presented a study where 33 patients with Chronic lymphocytic leukemia were treated twice a day with various dosages (400mg-2,000mg) of EGCG (epigallocatechin gallate), a polyphenol or plant-based antioxidant found in green tea that appears to have strong cancer fighting activity in the body. According to the author, the study suggested that all dosages of EGCG tested were well tolerated by all patients, the number of leukemia cells were reduced in about 1/3 of the patients, and that for 11 out of 12 patients with enlarged lymph nodes, a reduction of about 50% or larger was diagnosed after treatment with green tea. However, this blog entry was not very informative because it left me with more questions such as how does EGCG work, or why is it that only some patients expressed the same results, so I decided to look deeper into the topic. Nevertheless, we must take into account that each person has a different biological environment, thus reacting different to this polyphenol. Green tea is the most popular tea in Japan and China, and it is made up using un-wilted, un-oxidized leaves from the plant Camellia sinensis. 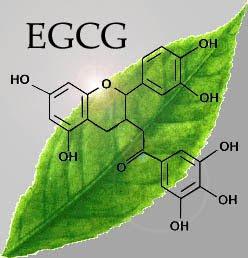 Moreover, EGCG is found to be the most abundant catechin in green tea (117–442 mg/L). In addition, the National Cancer Institute propose that tea polyphenols (i.e. EGCG) show certain characteristics in vitro and animal studies, which suggest the inhibition of the following hallmarks of cancer cells: limitless replication potential, evasion of programmed death, sustained angiogenesis, and tumor cell invasiveness. Additionally, the NCI suggest that green tea activate detoxification enzymes, such as glutathione S-transferase, which is a family of enzymes in charge of making toxic compounds less harmful for the body, which may help for the development of tumors cells. However, the NCI states in its websites that the results of many human studies have been inconclusive thus far. So far everything sounds great and good, but what are the possible consequences of consuming too much green tea? Although green tea and EGCG have great chemo protective characteristics so far, it can also cause excess intestinal gas, nausea, heartburn, stomachache, abdominal pain, dizziness, headache, and muscle pain as shown in studies conducted between 1-4 weeks (1200 mg of EGCG). Moreover, green tea also contains caffeine, which can also have adverse effects such as nervousness, tachycardia, insomnia, and restlessness. We need to take into account that by drinking large quantities of tea we are not only consuming EGCG, but other things as caffeine, which could have the side effects mentioned above, or iron that may or may not cause consequences for those suffering of iron-deficiency anemia. So why is it that we are not using green tea in chemotherapy treatments for humans at a larger scale? How much green tea, would one have to consume on daily basis to get the chemoprotective benefits? How does EGCG work, and what is the mechanism that inhibits cell proliferation? Can any other compounds inhibit EGCG activity? How effective is EGCG, and is it worth it a try? Could other types of tea be used, and have the same benefits as green tea? Is EGCG responsible for the seen results, or is that EGCG is activating or deactivating another compound responsible for the seen results in previous tsudies? Many of these questions I will try to address on my next entry where I would go more in depth to explain the mechanism by which EGCG works at a molecular level in cancer cells, as well as show very interesting information from various studies that have been done in vitro using EGCG and other compounds. 1) JP. "Green Tea and Leukemia ." Healthy Fellow - Diet, Exercise and Natural Health Blog . N.p., 28 May 2009. Web. 29 Apr. 2011 http://www.healthyfellow.com/248/green-tea-and-leukemia/. 2) "Tea and Cancer Prevention - National Cancer Institute ." Comprehensive Cancer Information - National Cancer Institute . N.p., 17 Nov. 2010. Web. 29 Apr. 2011. http://www.cancer.gov/cancertopics/factsheet/prevention/tea.